It is estimated that 1.6% of women will develop an ovarian malignancy during their lifetime.4 Another 10% will have a benign tumor of the ovary requiring surgery. The percentage of women requiring surgery for adnexal pathology during their lifetime is even higher if endometriotic cysts, symptomatic hemorrhagic and follicular cysts, and residuals of pelvic inflammatory diseases are included. Although exact numbers are difficult to calculate, many women with benign physiologic cysts, hemorrhagic cysts, residuals of pelvic inflammatory disease, hydrosalpinges, and pedunculated leiomyomas undergo surgery when expectant management could have been used. Identify hemorrhagic corpus luteum, functional cysts, hydrosalpinges, and peritoneal adhesive disease and avoid operative interventions for them if possible. Differentiate benign from malignant disease of the ovary and Fallopian tube. Discriminate gastrointestinal and uterine patho-logy from ovarian or Fallopian tube processes. The patient's age, history, and pelvic examination are important in the diagnostic paradigm. The obstetrician-gynecologist who is properly trained in diagnostic ultrasound (including transvaginal studies) therefore has a distinct advantage because of his or her clinical knowledge of female reproductive tract pathophysiology. As in all areas of medicine, practitioners are strongly advised not to overstep their diagnostic acumen and to liberally seek the advice of experts. Examples of these categories are shown in Figures 1, 2, 3, 4, and 5. A mass is considered complex if it contains solid elements or thick or irregular septations, or if ascites is noted. Recent logistic regressions by Tailor and coworkers and Schelling and associates have confirmed that the presence of solid elements within a mass is the most predictive in identifying malignancy.10, 11 As shown in Table 1, most malignancies in Osmers's series occurred in the complex group. 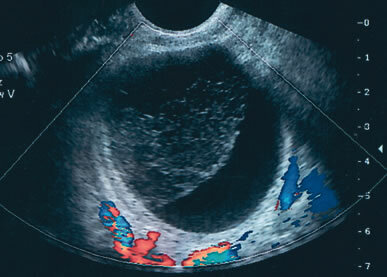 Osmers's system has a degree of subjectivity; a 5-cm thin-walled cystic mass with one or two thin septations could be categorized as either cystic or complex. This distinction ultimately depends on the informed judgment of the sonologist. Fig. 1. Three-dimensional orthogonal images of a simple 4-cm cyst in a premenopausal woman. 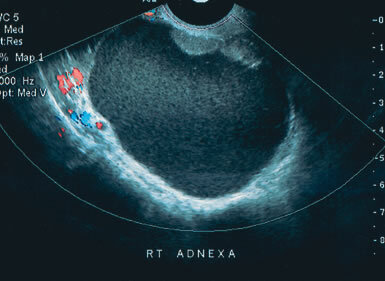 The image in the bottom right is a rendering of a portion of the inner cyst wall. No excrescences were noted. The cyst resolved spontaneously. Fig. 2. A biloculated 6-cm mass in a premenopausal woman. 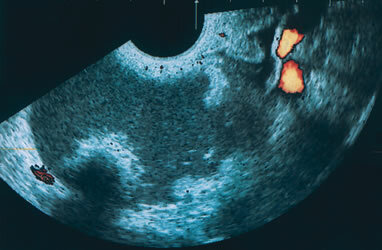 The upper cyst, which is filled with low-level echogenicity, is typical of the pattern seen in endometriotic cysts. After 8 weeks of expectant management, the lower cyst resolved. 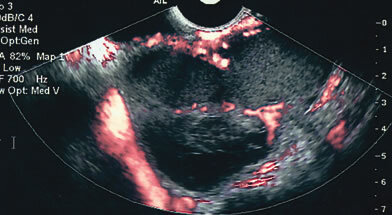 At surgery, the residual cyst was identified as an endometrioma. Fig. 3. A 3-dimensional study in a perimenopausal patient identified a multiloculated 3.5-cm cyst. Power Doppler examination was unremarkable. Surgery revealed a benign cystadenoma. Fig. 4. A complex 12 × 10-cm mass in a premenopausal woman contained multiple septations with solid elements that had marked vascular flow. The mass was correctly identified as malignant (Stage III papillary adenocarcinoma). Fig. 5. A highly vascular 8 × 6-cm solid mass in this postmenopausal patient was a Stage III poorly differentiated adenocarcinoma. Osmers R, Osmers M, von Maydell B et al: Preoperative evaluation of ovarian tumors in the premenopause by transvaginosono-graphy. Am J Obstet Gynecol 175:428, 1996. Careful review of Osmers's series9 is informative. The study comprised 1072 premenopausal women referred with adnexal masses greater than 3 cm. The protocol included re-scanning all masses after 6 weeks to check for resolution of functional cysts. In the study, 53% of the masses proved to be functional or hemorrhagic cysts, 25% endometriotic cysts, 18% benign neoplasms, and 4% malignant neoplasms. Operations were avoided in 90% of the women with functional or hemorrhagic cysts. Of the remaining 10%, half required surgery for peritoneal irritation, and in the other half the referring physicians operated without waiting the 6 weeks even though their patients were asymptomatic. Fig. 6. A 5-cm thin-walled cyst in a premenopausal woman. Thin low-level echoes are noted in a lattice-like pattern, with no vascular flow in the areas of internal echogenicity. This pattern is typical of a resolving hemorrhagic cyst, and was confirmed by this cyst's spontaneous resolution. The role of expectant management of simple menopausal cysts less than 5 cm has been studied by Bailey and colleagues.14 These cystic masses are estimated to occur in 3% to 5% of menopausal women. The American College of Obstetricians and Gynecologists (ACOG) has issued guidelines for the expectant management of these masses (Table 2).15 The malignant potential is believed to be less than 1%. American College of Obstetricians and Gynecologists, Criteria Set No. 15. April 1996. Once the mass has been characterized into one of Osmers's five categories, a histologic differential should be provided if appropriate. Papers by Milad and Cohen16 and Jermy and colleagues8 have noted that many persistent ovarian cysts found in premenopausal women can be accurately identified by their characteristic echo-patterns as endometriomas or cystic teratomas using transvaginal ultrasound. In nonpregnant women from age 20 to 40, functional cysts, hemorrhagic cysts, endometriomas, and cystic teratomas will account for close to 90% of the ovarian masses seen in the average clinician's office practice. Fig. 7. 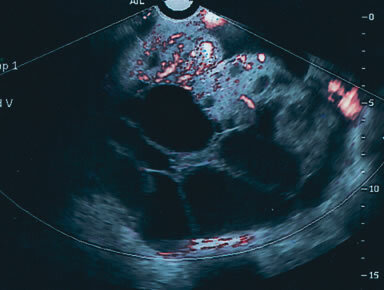 A 6-cm cystic mass in a premenopausal woman is filled with low-level echoes. Cyst wall irregularities are noted superiorly. Doppler examination was negative. The mass was correctly identified as an endometriotic cyst. Fig. 8. 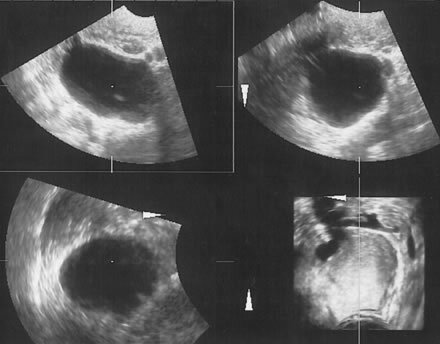 This complex 8 × 4-cm mass was identified in a pregnant woman. A 2-cm area of excrescence with acoustic shadowing is seen ( left ). Power Doppler examination was negative. 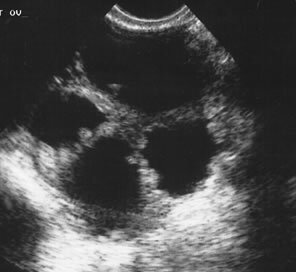 The mass was correctly identified as a benign cystic teratoma. Fig. 9. A 5-cm multiloculated mass containing multiple excrescences was identified as a borderline or frank adenocarcinoma. Pathology showed a Stage I borderline adenocarcinoma. Fig. 10. A rendered 3-dimensional image of hydrosalpinx with typical cross striations. The elongated tube is folded in a U-shape. Unfortunately, there remains some diagnostic overlap between malignant and benign pathology. Papillary adenocarcinomas and malignant germ cell tumors have been misdiagnosed as cystic teratomas. Granulosa cell tumors can be confused with endometriomas. Benign adenofibromas are frequently confused with malignant papillary adenocarcinomas or borderline tumors. The addition of color or power Doppler as a secondary test can be helpful in differentiating these entities, and is reviewed in the following section. Even with the system described above, errors will occur in the prediction of benign and malignant processes. The assessment of an adnexal mass depends on physical examination, the patient's history and age, and the findings on ultrasound examination. The three-part assessment consists of a morphologic description, an echo-pattern assessment of possible histology, and power or color Doppler as a secondary test. It is anticipated that the addition of new serum tumor markers will enhance the clinician's ability to discriminate between benign and malignant disease. ACOG Practice Bulletin #83. Management of adnexal masses. Obstetrics and Gynecology 2007: 83:201-214. Guerriero S, Ajossa S, Piras S et al. Three-dimensional quantification of tumor vascularity as a tertiary test after B-Mode and power Doppler evaluation for detection of ovarian cancer. J Ultrasound Med 2007;26:1271-1278. Sladkevicius P, Jokubiene, and Valentin L. Contribution of morphological assessment of the vessel tree by three-dimensional ultrasound to a correct diagnosis of malignancy in ovarian masses. 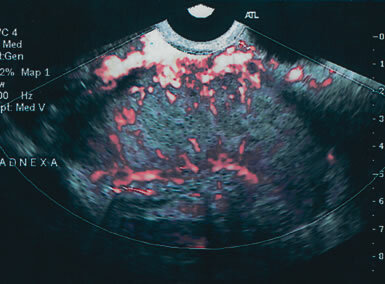 Ultrasound Obstet Gynecol 2007;30:874-882. Sato S, Yokoyama Y, Sakamoto T, et al. 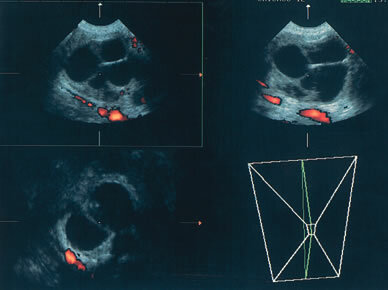 Usefullness of mass screening for ovarian carcinoma using transvaginal ultrasound. 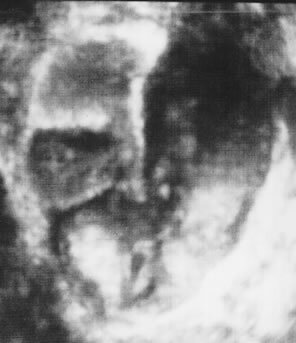 Cancer 2000; 89:582-588. Buys SS, Patridge E, Greene MH. Ovarian cancer screening in the PLCO cancer screening trial. AJOG 2005:1630-1639. Jacobs IJ, Skates SS, MacDonald N, et al. Screening for ovarian cancer: a pilot randomised controlled trial. Lancet 1999;353:1207-1210.